Occasionally personal information (name, email address, phone number, etc. ), is requested to verify identification. Generally this information is requested during registration and when purchasing products. This information may also be used to contact customers regarding order or account status, special offers, or new products and services being offered. We DO NOT share your personally identifiable information with third parties. As is true of most Web sites, we automatically gather certain non-personally identifiable information about visitors to our Web site in the aggregate and store it in log files. This information includes internet protocol (IP) addresses, browser type, internet service provider (ISP), referring/exit pages, operating system, date/time stamp, and clickstream data. We use this information, which does not identify individual users, to analyze trends, to administer the site, to track users’ movements around the site and to gather demographic information about our user base as a whole. We do not link this automatically-collected data to personally identifiable information. Full credit will be given for shipping errors made by Paragon Enterprises Inc. and products damaged in transit, provided the error or damage is reported to Paragon Enterprises Inc. Customer Service Department within 72 hours of the receipt of the product. All returns must be authorized in advance. Please call Paragon Enterprises Inc. Customer Service Department at (800) 758-2955 to obtain a return authorization form that must completed and signed. The return authorization form should be marked clearly. At Paragon Enterprises Inc. sole discretion, Paragon Enterprises Inc. may authorize and accept returns for reasons other than shipping error or damage as long as Paragon Enterprises Inc. determines, in its sole discretion, that the product is re-sellable. Credit for these returns will be given at the current market price of the returned product less a 20% handling charge. You warrant that you are at least 18 years of age and possess the capacity and legal authority to enter into this agreement and to use the PARAGONMEDS web sites and the product and services contained therein in accordance with all terms and conditions herein. If you are buying goods or using services on the PARAGONMEDS web sites, then you further warrant that you have the capacity and legal authority to enter into other binding agreements for the sale or purchase of goods and services. You agree to be financially responsible for all of your use of the PARAGONMEDS websites (as well as for use of your account by others, including without limitation minors accessing or using your account or password). You warrant that all information supplied by you or members of your business in using the PARAGONMEDS web sites, including without limitation your name, email address, street address, telephone number, is true and accurate. Failure to provide accurate information may subject you to civil and criminal penalties. This Web site contains links to other sites that are not owned or controlled by Paragon Enterprises Inc. Please be aware that we, Paragon Enterprises Inc., are not responsible for the privacy practices or content, products or services of such other sites. We encourage you to be aware when you leave our Web site and to read the privacy statements of such other sites. This privacy statement applies only to information collected by this Web site. If a particular PARAGONMEDS web site requires you to open an account, you must complete the registration process by providing us with current, complete and accurate information as prompted by the applicable registration form. Furthermore, you are entirely responsible for any and all activities that occur under your account or password. You agree to notify PARAGONMEDS immediately of any unauthorized use of your account or any other breach of security. PARAGONMEDS will not be liable for any loss that you may incur as a result of someone else using your password or account, either with or without your knowledge. Additionally, you could be held liable for losses incurred by PARAGONMEDS or another party due to someone else using your account or password. You may not use anyone else's account at any time, without the expressed permission of the account holder. Payment is due in accordance with the terms reflected on the invoice. Paragon Enterprises Inc. reserves the right to charge interest at the rate of 1.5% per month if payment is not made in a timely manner. Paragon Enterprises Inc. shall be entitled to recover reasonable attorneys’ fees and cost in connection with any collection efforts, including but not limited to litigation arising out of failure to pay your invoice or statement. Paragon Enterprises Inc. will credit your payment to the oldest invoice or statement unless your remittance document otherwise states the invoice being paid or the payment exactly matches a specific invoice or statement amount. Paragon Enterprises Inc. reserves the right to change the terms, conditions, and notices under which the PARAGONMEDS web sites are offered, including but not limited to the charges associated with the use of the PARAGONMEDS web sites. You are responsible for regularly reviewing these terms and conditions and additional terms posted on particular PARAGONMEDS web sites. Your continued use of the PARAGONMEDS web sites constitutes your agreement to all such terms, conditions, and notices. 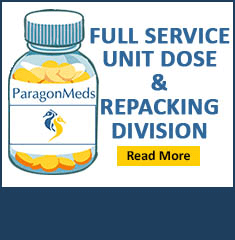 Paragon Enterprises Inc. reserves the right, in its sole discretion, to terminate your access to any or all PARAGONMEDS web sites and the related services or any portion thereof at any time, without notice, for no reason or for any reason. Paragon Enterprises Inc. may also terminate or suspend your access to PARAGONMEDS web sites for inactivity, which is defined as failing to log into a particular service for an extended period of time, as determined by PARAGONMEDS. Upon termination of your access to any of the PARAGONMEDS web sites, your right to use the PARAGONMEDS web sites immediately ceases. Paragon Enterprises Inc. shall have no obligation to maintain any content, services or products or to forward any unread or unsent messages to you or any third party. THE INFORMATION, SOFTWARE, PRODUCTS, AND SERVICES INCLUDED IN OR AVAILABLE THROUGH THE PARAGONMEDS S WEB SITES MAY INCLUDE INACCURACIES OR TYPOGRAPHICAL ERRORS. ALTHOUGH PARAGONMEDS USES ITS BEST EFFORTS TO PROVIDE INFORMATION THAT IS ACCURATE AND UP TO DATE, PARAGONMEDS ASSUMES NO LIABILITY OR RESPONSIBILITY FOR ANY ERRORS OR OMISSIONS IN THE INFORMATION ON THE PARAGONMEDS WEB STIES. CHANGES ARE PERIODICALLY MADE TO THE PARAGONMEDS WEB SITES AND TO THE INFORMATION, SOFTWARE, PRODUCTS AND SERVICES THEREIN. PARAGONMEDS AND/OR ITS RESPECTIVE SUPPLIERS MAY MAKE IMPROVEMENTS AND/OR CHANGES IN THE PARAGONMEDS WEB SITES AT ANY TIME. INFORMATION ON THE PARAGONMEDS WEB SITES IS NOT INTENDED TO BE PERSONAL, MEDICAL, LEGAL OR FINANCIAL ADVICE AND SHOULD NOT BE RELIED UPON FOR PERSONAL, MEDICAL, LEGAL OR FINANCIAL DECISIONS. YOU SHOULD CONSULT AN APPROPRIATE PROFESSIONAL FOR SPECIFIC ADVICE TAILORED TO YOUR SITUATION. NEITHER PARAGONMEDS NOR ANY OF ITS RESPECTIVE SUPPLIERS MAKES ANY REPRESENTATION ABOUT THE SUITABILITY, RELIABILITY, AVAILABILITY, TIMELINESS, LACK OF VIRUSES OR OTHER HARMFUL COMPONENTS OR ACCURACY OF THE INFORMATION, SOFTWARE, PRODUCTS, SERVICES OR RELATED GRAPHICS CONTAINED WITHIN THE PARAGONMEDS WEB SITES FOR ANY PURPOSE. ALL SUCH INFORMATION, SOFTWARE, PRODUCTS, SERVICES AND RELATED GRAPHICS ARE PROVIDED "AS IS" WITHOUT WARRANTY OF ANY KIND. PARAGONMEDS AND ITS RESPECTIVE SUPPLIERS HEREBY DISCLAIM ALL WARRANTIES AND CONDITIONS WITH REGARD TO ALL SUCH INFORMATION, SOFTWARE, PRODUCTS, SERVICES AND RELATED GRAPHICS, INCLUDING WITHOUT LIMITATION ALL IMPLIED WARRANTIES AND CONDITIONS OF MERCHANTABILITY, FITNESS FOR A PARTICULAR PURPOSE, WORKMANLIKE EFFORT, TITLE AND NON-INFRINGEMENT. YOU SPECIFICALLY AGREE THAT Paragon Enterprises Inc. SHALL NOT BE RESPONSIBLE FOR UNAUTHORIZED ACCESS TO OR ALTERATION OF YOUR TRANSMISSIONS OR DATA, ANY MATERIAL OR DATA SENT OR RECEIVED OR NOT SENT OR RECEIVED, OR ANY TRANSACTIONS ENTERED INTO THROUGH ANY PARAGONMEDS WEB SITE. YOU SPECIFICALLY AGREE THAT Paragon Enterprises Inc. IS NOT RESPONSIBLE OR LIABLE FOR ANY THREATENING, DEFAMATORY, OBSCENE, OFFENSIVE OR ILLEGAL CONTENT OR CONDUCT OF ANY PARTY OR ANY INFRINGEMENT OF YOUR OR ANOTHER'S RIGHTS, INCLUDING WITHOUT LIMITATION INTELLECTUAL PROPERTY RIGHTS. YOU SPECIFICALLY AGREE THAT Paragon Enterprises Inc. IS NOT RESPONSIBLE FOR ANY CONTENT SENT USING AND/OR INCLUDED IN ANY PARAGONMEDS WEB SITE TO OR FROM ANY THIRD PARTY. Our site has security measures in place to protect your information. All web servers are placed behind a firewall and monitored to prevent outside access. SSL sessions are used to encrypt your sensitive data protecting it from disclosure to third parties. Contact Us: Paragon Enterprises Inc. Address: 3300 Corporate Ave Suite #114, Weston FL 33331. Copyright 2017 Paragon Enterprises Inc. All rights reserved. ®ParagonMeds A Paragon Enterprises Inc. Company. This material may not be published, broadcast, rewritten or redistributed in any form without Paragon Enterprises Inc. written permission. The images shown do not necessarily reflect the actual image of the product.